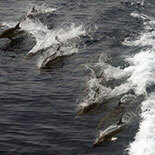 Cruises run December through April 21 and sail daily at 9:30am. 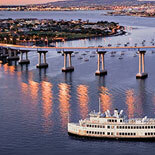 Come aboard the San Diego Winter Whale Watching Cruise, where you will be treated to awe-inspiring sights of the majestic Gray Whale and the scenic magnificence of San Diego's Coronado Bay Bridge, Seaport Village and America's most historic warships to name a few. Winter Whale watching season with Hornblower Cruises & Events runs from December through April, with approximately 28,000 gray whales passing by the San Diego coast. Other wildlife, such as sea lions, blue herons and three kinds of dolphins put in appearances, so have your cameras focused and ready. The average size of a Gray Whale is approximately 30 to 50 feet long and may weigh up to 35 tons. They spend the summer months in the Bering and Chukchi Seas, then leave for the breeding lagoons along western Baja California, Mexico. 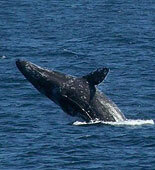 Gray whales follow the longest migration route of any mammal on Earth, sometimes traveling 12,400 miles round trip. In December, the first pass along the California coast, with peak numbers passing by in early January and remain until late March, within six miles off the coastline. Whether you're a tourist looking for the best way to see all of the San Diego attractions, or a local that knows the best way to entertain out of town guests, Hornblower has something for you. All aboard! 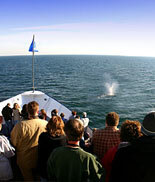 Make your reservations and get your eTickets today for The San Diego Whale Watching Cruise. 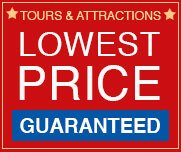 It's a once in a life time adventure for the entire family! Reservations are required. E-Ticket will contain details to reconfirm this reservation. 970 Harbor Drive, San Diego, 92101. Harbor Drive and Broadway Ave. Parking is available in the Five Star parking lot located on the corner of Pacific Coast Highway and Broadway, on a first come, first serve basis. Hornblower does not validate. Metered parking with a 3-hour maximum are available across from the ticket booth Mon through Sat until 6:00 pm. They are free after 6:00 pm and on Sundays. Child Ticiket: 4-12 years. Under 4 are free. 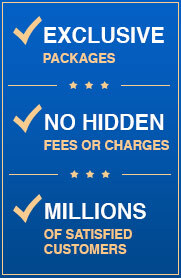 Hornblower does have handicap accessible yachts in the fleet. Please check with Reservations for more details. Smoking is allowed on the outside decks only. Bring a light jacket and dress appropriate for weather. Hornblower sails rain or shine. In the very rare case of severe weather conditions or upon the direction of the U.S. Coast Guard, we will remain dockside.